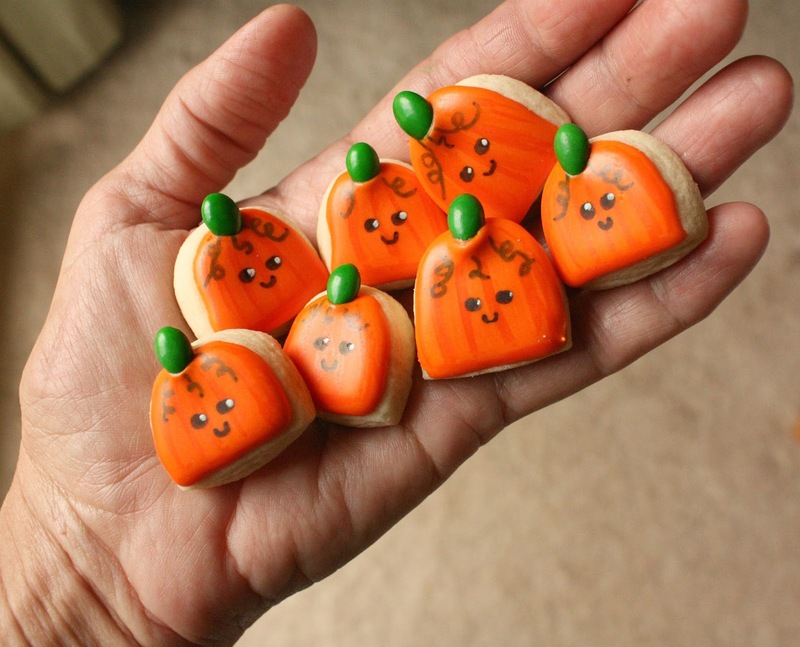 I made these mini pumpkin cookies a couple of weeks ago when fall had not officially started. They were my first fall cookies of the season this year. As you can see they are very simple cookies, and also very cute. I'm smitten! I used the oval cutter from THIS Ateco petit four cutter set, and cut the dough in half to make the pumpkins. 1. Prepare cookie dough, roll and cut out cookies. and bake according to recipe. 2. Tint the royal icing orange. 4. While the icing is still wet, add the sunflower seed (stem) to the top of the pumpkin. 5. Allow cookies to dry completely. 6. Using the orange marker, make vertical lines on the pumpkins. 7. Use the yellow marker to coat the pumpkin, just to brighten it up a bit (optional). 8. Use the green marker to make curly vines coming from the stem. 9.With the black marker, add eyes and a smile. 10. Dip the tip of a toothpick into undiluted white gel food coloring and add the eye detail. These would be very cute added to a fall cookie platter or filled up in a jar for a gift. Absolutely the cutest they could be! POW! positively petite palm pumpkin pookies! perfect! They look awesome and delicious! Glad the Ateco petit four cutter set worked well for this project! Thanks for your comment, Evan.